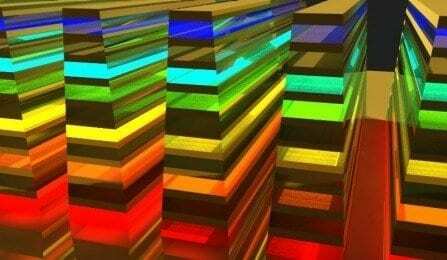 University at Buffalo engineers have created a more efficient way to catch rainbows, an advancement in photonics that could lead to technological breakthroughs in solar energy, stealth technology and other areas of research. Qiaoqiang Gan, PhD, an assistant professor of electrical engineering at UB, and a team of graduate students described their work in a paper called “Rainbow Trapping in Hyperbolic Metamaterial Waveguide,” published Feb. 13 in the online journal Scientific Reports. They developed a “hyperbolic metamaterial waveguide,” which is essentially an advanced microchip made of alternate ultra-thin films of metal and semiconductors and/or insulators. The waveguide halts and ultimately absorbs each frequency of light, at slightly different places in a vertical direction (see the above figure), to catch a “rainbow” of wavelengths. Gan is a researcher within UB’s new Center of Excellence in Materials Informatics. “Electromagnetic absorbers have been studied for many years, especially for military radar systems,” Gan said. “Right now, researchers are developing compact light absorbers based on optically thick semiconductors or carbon nanotubes. However, it is still challenging to realize the perfect absorber in ultra-thin films with tunable absorption band. Light is made of photons that, because they move extremely fast (i.e., at the speed of light), are difficult to tame. In their initial attempts to slow light, researchers relied upon cryogenic gases. But because cryogenic gases are very cold – roughly 240 degrees below zero Fahrenheit – they are difficult to work with outside a laboratory. Before joining UB, Gan helped pioneer a way to slow light without cryogenic gases. He and other researchers at Lehigh University made nano-scale-sized grooves in metallic surfaces at different depths, a process that altered the optical properties of the metal. While the grooves worked, they had limitations. For example, the energy of the incident light cannot be transferred onto the metal surface efficiently, which hampered its use for practical applications, Gan said. The hyperbolic metamaterial waveguide solves that problem because it is a large area of patterned film that can collect the incident light efficiently. It is referred to as an artificial medium with subwavelength features whose frequency surface is hyperboloid, which allows it to capture a wide range of wavelengths in different frequencies including visible, near-infrared, mid-infrared, terahertz and microwaves. It could lead to advancements in an array of fields.